The 50 Day Movie Challenge asks one question every day, to be answered by a few paragraphs and a clip, if possible. Click here to see all 50 questions in a nice and organized list. It’s such a pretty list. TODAY: What male performance ranks as your favorite? TODAY: What’s a film that you walked out of? TODAY: What is your favorite movie ending? TODAY: What is your favorite opening sequence? TODAY: What’s your favorite movie soundtrack? TODAY: What’s your least favorite movie by your favorite director? TODAY: What’s your favorite documentary? TODAY: What movie have you watched the most in your life? 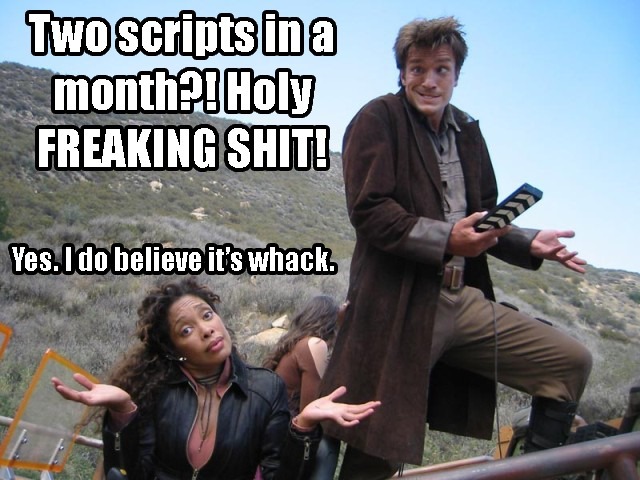 April 1st came around and two things happened: I completely forgot that it was April Fools Day and I began the screenwriting boot camp known as Script Frenzy. If you’ll recall, I wrote earlier about my plans to write two scripts to make up for the zero I wrote last year. Well, I’m here today to tell you that I’m done with my first script, LAMENT. It’s a Steampunk Western Revenge Flick about a father and a husband who will stop at nothing to kill the man responsible for ruining his life. There’s action, there’s drama and there’s enough steampunk to whet your appetite. All in all, the script took me eleven days to write, averaging out about ten pages a day with a day or two off to keep my sanity. I discussed the beauty of outlining in my last post and the proof was in how easy it was to bang out the script. I essentially breezed through ten pages, checked my notes, and then soared through another. Naturally, my script ended at page 93. The other thing that also seems to fall by the wayside is the dialog. The first few days of writing (roughly 30-40 pages) saw some interesting dialog between the characters, stuff that gave you a decent idea as to what made them tick. Granted, we’re not talking Tarantino’esque yakking, but something useful for a first draft. By the last page, no one was saying a word except for the villain and he repeated himself to an annoying extent.